Rock Castle storage now has two convenient locations and we’re offering a 50% savings on your first month’s rental unit price at both our Dayton and Middletown locations. If you’re planning that move or just looking to store away some unused personal or business items, now’s the time to contact Rock Castle Storage. 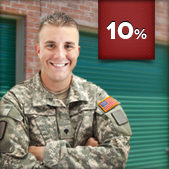 * Offer valid when renting a storage unit for 3 months or more. In appreciation and support, we would like to honor your commitment and respect the sacrifices you have made to secure our freedom. We know that when you’re away from home you don’t want to be concerned about the safety of your personal belongings. Choose Rock Castle Storage for a stress free self-storage solution. * Offer valid with proof of Military ID. Let’s face it. You’re moving out and going to college. Exciting! Unfortunately, you’ll probably live in a dorm that can accommodate maybe a third of you’re belongings and zero percent of your furniture. We can rent you space and help save you money in the process. Try Rock Castle Storage. * Offer valid with proof of current College ID. !Be careful, many of our competitors charge a variety of service fee’s that we don’t. These fee’s can drastically increase your monthly storage expense. Dayton (937) 235.0000 | Middletown (513) 423.1790 today for a free quote!